The buffalo are a native animal to the North American continent, including Canada and the United States. Buffalo roamed in the millions over 200 years ago. But with the migration of settlers from the east coast of the United States or known territory back in the mid-1880’s, the buffalo began to dwindle in numbers. As transportation had advanced from horse and wagon to the building of the rail road that connected the east coast with the growing population of the west, and with the ease of travel on the train, more people would immigrate. The problem that arose, is the migration of the buffalo during certain times of the year, and the train and its tracks would pass along the same path as the buffalo. For what ever reason they had, the United States Congress gave the railroad permission to shot at the roaming buffalo as the train moved down the track through the Midwest on to the West Coast. The buffalo fell by the thousands and their carcasses would lye there to only rot. There fur and meat would benefit no one as it had for the native people for thousands of years, who only killed the buffalo when in need of food and clothing. Nothing went to waist when the natives hunted the buffalo, as it did when the then migrating American’s shot them dead where they were stampeding. By the 1860’s it was estimated that only 1000 Bison or buffalo was roaming the Central Plains of then know territories of the growing United States. By 1872 the Bison was protected by a proclamation of Congress of the USA. The buffalo numbers have grown to only about 30,000 as of the estimation in 2010. 500,000 live on private lands and ranches in the Central Plains and Midwest of the now United States of America. Buffalo is now raised for slaughter to market as a food staple. They are not feed the same diet as the traditional cow, but a diet that is normal to buffalo as they move about and graze the land. 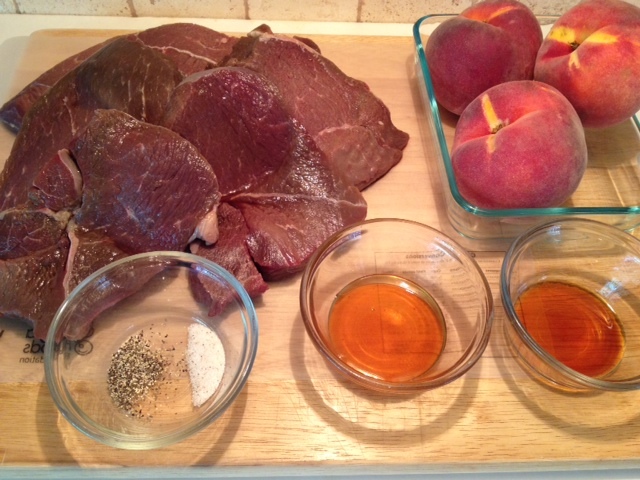 With that, we come to our featured recipe: Peach Teriyaki Buffalo Sirloins and Accompanying Side Dishes. 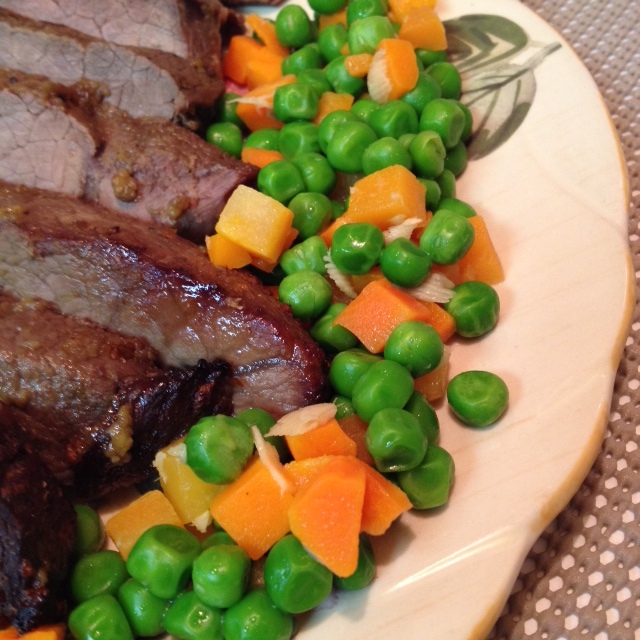 Carrots and peas are always a great addition to a meat dish, but because our main course plated is marinated with teriyaki, and to stay with the Asian theme, we added the ginger to the vegetables. Our next side dish is also an Asian tradition, Chopped Asian Salad. Here is to prepare it starting with the dressing. 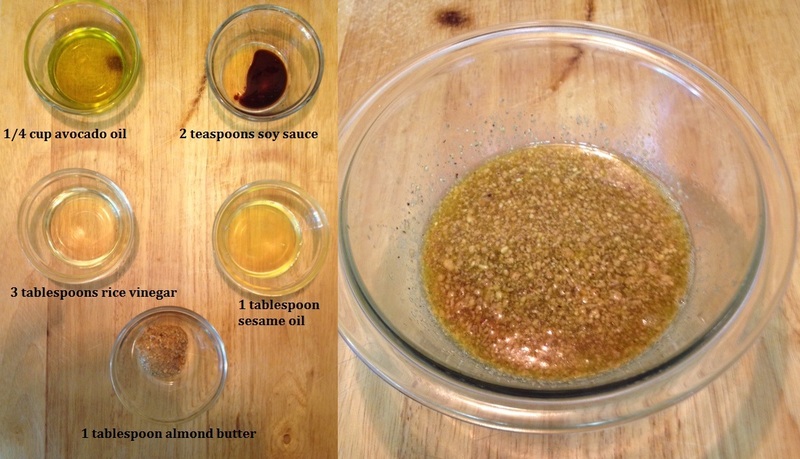 Mix the almond butter and all of the other liquid ingredients in a small bowl and set aside. Prepare the vegetables and mix together with the slivered almonds in a large salad bowl. Form a hole in the center of the salad, and pour the dressing the center and mix into the salad until well coated. Now for the main course: Peach Teriyaki Buffalo Sirloins. 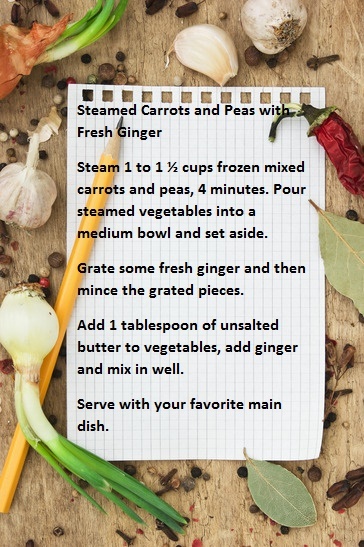 You will need about 40 ounces of buffalo sirloins or about 3 pounds of meat. 3 medium peaches or 2 large ones, peeled and pitted. 1/4 cup of organic local honey, and 3 tablespoons of teriyaki. Salt (preferably Himalayan salt) and pepper both sides of the sirloins and place them into a zip-lock bag or large bowl. 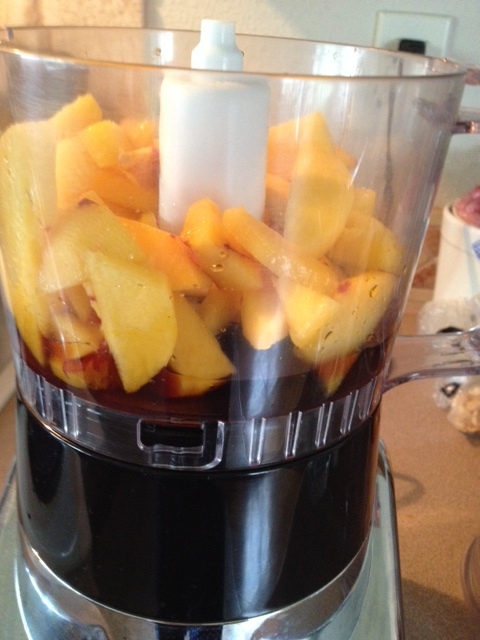 Place peeled and pitted peaches into a food processor along with the honey and teriyaki sauce, and puree. Next pour into the bag or over the meat if you are using a bowl and mix in well. Let the meat marinade at least 1 hour. You can either choice to broil or BBQ your marinaded buffalo sirloin steaks. During the cooking process, use the marinade to baste the meat as you turn it. 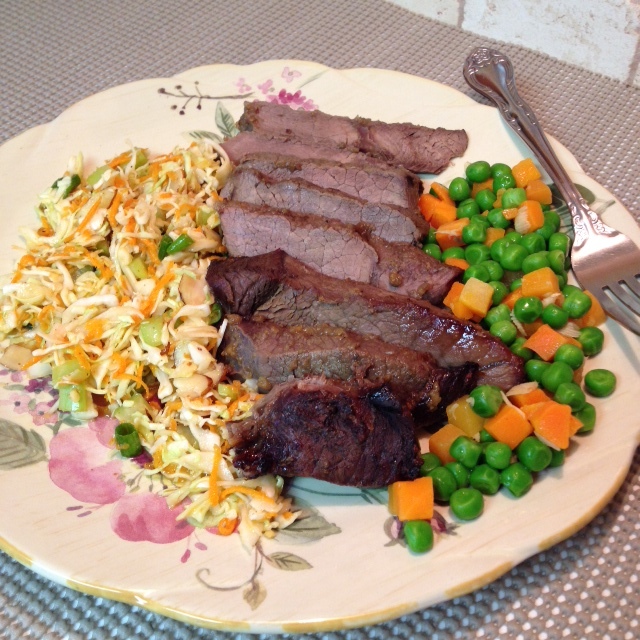 Cook sirloins to 160 degrees internal temperature and enjoy meat that is high in omega-3 fatty acids. Your body will thank you for it!! Need some dessert ideas, link here and see what Splendid Recipes and More has to offer: Desserts. August, 2003. Buddha’s Salad. From The Archives. 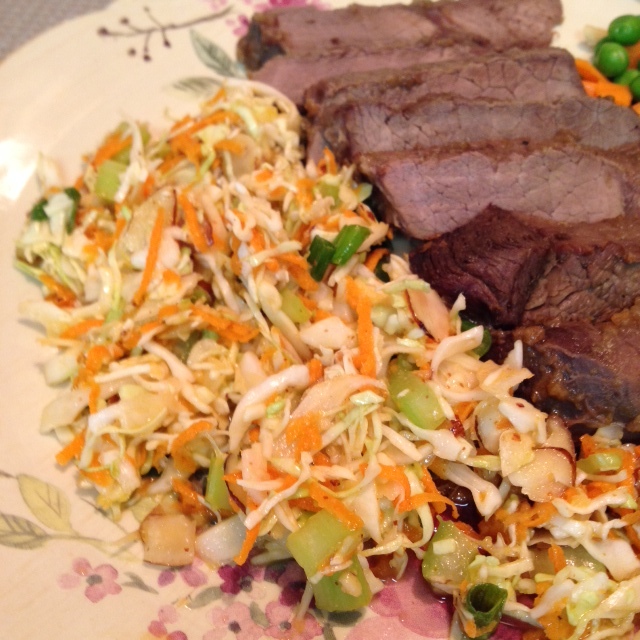 This entry was posted in Buffalo and tagged almond butter, Asian chopped salad, Bison, Buffalo, Buffalo Sirloins, Canada, carrots, Ginger, Honey, Mushroom, organic honey, Side dish, Soy sauce, Teriyaki, United States. Bookmark the permalink. What a great combination of ingredients, Randy. Lovely presentation also. Thank you Jovina. I never had Buffalo before, and I thought we would give it a try. Was really different from beef, and not bad tasting. Considering they are grown wild. Hey Roger I hope you plan to enjoy this meal. Keep in mind the meat of buffalo is higher in omega-3 as it is not fed grain, like corn. It may be true that buffalo is red meat, but its meat is healthier for you than the meat of a cow (high in omega-6 for corn feed). Also compare the color of buffalo meat to cow meat and you will notice a difference. I have never tried Buffalo meat but I think we would like it. We enjoy deer, elk and moose meat. I like the marinade you choose and peaches with it. It looks delicious. This is a perfect fall and winter Sunday meal. Thanks Honey. The marinade sauce was great. I have had Elk only one time and I did enjoy it, very different from beef. The buffalo also was my first time trying it. Actually a friend have us those sirloins. Thanks for stopping by and also for sharing a comment! !